Welcome to the latest in the series A portrait of Thame… Where this time I photograph Stuart from Thame United. At the end of last year I photographed Kayleigh of Thame Ladies FC. Kayleigh I’d photographed leaning against a goal post and I knew that I wanted to do something different with Stuart. 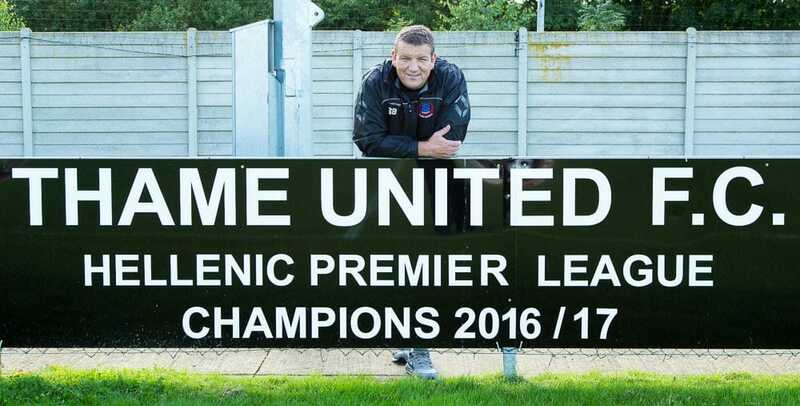 Stuart and I agreed that following the success of last season that we should incorporate the large sign which sits at the edge of the ground proclaiming their league win. For this portrait we tried several different approaches, Stuart crouching in front of the sign from various angles and the image you see above of Stuart stood behind leaning over the sign. We both felt that this was the pose that worked the best and that this was the image to use. From a technical point of view, the weather on the evening we had scheduled came through with some sunshine despite having been squally showers for most of the rest of the day. Therefore, I only needed to increase the ISO from my usual 100 to 200. A quick meter off of the grass (top tip, grass is not far off of a neutral tone and is great to meter off) and I was set to go. Once I had the image back at the studio and on the computer I only needed to make a few adjustments to bring out the best of the colours in the image. Coupled with a simple crop to keep the image focussed on Stuart and not get lost with negative space and I was ready to output the file and send it to Thame Hub for publication. I’d like to take the opportunity to wish Thame United all the best for the upcoming season. If you are looking to support a league winning local club this year, can I suggest you get yourself along to Thame United and show your support.